Wednesday started out as atypical day at the J. Michael office, identifying stone-types for customers and uploading photos to our Twitter account, but we soon realized we had a visitor! On this particular Wednesday, there was an interesting critter hanging out on our front glass door. With black and orange stripes and a longish body, this adorable guy looked more like a Halloween decoration than a living creature! We knew it was a caterpillar, but being part of a landscape company, the crews were interested to know more. So, we had a competition to see who could name the type of caterpillar, and here is what we learned! 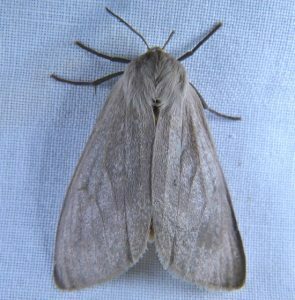 The Milkweed Tussock Moth is sometimes referred to as the Milkweed Tiger Moth! (We should have known!) And like many critters, the Milkweed Tiger moth gets its name from its diet – milkweed. Interestingly, many insects that live on milkweed have the black and orange pattern, which warns predators to stay away. In fact, a chemical in the milkweed causes predators, such as blue jays, to become sick, and these animals now recognize the orange and black display as a warning to avoid. (Animals are so cool.) Now you might be wondering, as we were, what these tigerpillars look like as butterflies! And to be honest, we were a bit disappointed. Milkweed TIGER caterpillars grow into drab, pale brown moths. However, the reason for its colorless existence is actually quite fascinating. As moths, the insect’s primary predators are bats, which hunt at night and use sound to track their pray, rather than sight! So, instead of flashing a bright amour to scare off predators, the moths have evolved an organ that that emits an ultrasonic signal easily detected by bats, warning against the insect’s unpleasant taste. And as intrigued as we were to hear about their awesome means of survival, the landscape crews were curious to hear if these Milkweed Tiger critters ever act as pests in the Massachusetts area. With decades of experience working in the industry, the key personnel at J. Michael say they don’t often run into complaints about Milkweed Tussock moths. But of course, anyone growing milkweeds will likely spot a variety of milkweed insects feeding on their plants, the most common being the Monarch butterfly. 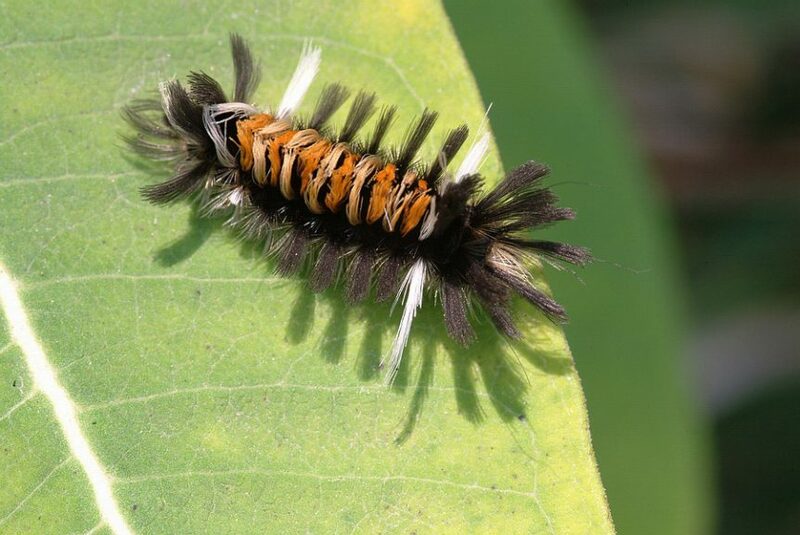 We are certainly interested in finding out if any of our readers have come across the Milkweed Tussock Tiger moth caterpillars, or if they have had any problems with them in the past! And while almost any species of pests can be controlled with the right treatments, we let our little creature free to continue onto its next cycle of life! Feel free to let us know your thoughts on social media!